If you happen to be a Game of Thrones fan, you know the Stark Family motto: “Winter is coming.” It’s inevitable and sometimes dangerous. According to all predictions, this winter will be a repeat of last year, or perhaps even worse. Most of the country can expect extreme cold, an abundance of snow, and a longer-than-normal winter. It may be early in the season, but that first storm of the year can sneak up on you. Now is the time to double check your preparations and be certain that you are ready for anything, well before the first snowflake falls. Many of us spend far more of our waking hours away from home, busy with work, school, or chauffeuring our kids to their various activities. Because of this, a vehicle emergency kit is vital. In recent winters, there were two notable situations during which a well-stocked kit would have been beneficial. During one scenario, a freak snowstorm struck the Atlanta, Georgia area. Because weather like this is such a rarity, the area was completely unprepared, officials didn’t have the experience or equipment needed to deal with it, and traffic gridlocked almost immediately. Hundreds of people were stranded as the freeway turned into a scene reminiscent of The Walking Dead, with bumper-to-bumper vehicles at a standstill. Those without food and water in their vehicles went hungry, and many people ran out of gas as they tried to keep warm. No matter how comfortable you are with winter driving, in a situation like this, you are at the mercy of others who may not be so experienced. The next situation had a lot more potential for a tragic ending, had it not been for the survival skills of a father of 4 small children. A family of six had taken off for a day of snowy adventure, when their Jeep flipped over in a remote part of the Seven Troughs mountain range in Northwestern Nevada. James Glanton, a miner and experienced hunter, kept his family alive and unscathed for two days in the frigid wilderness using only the items from his vehicle and the environment. Due to his survival skills and the things he had on hand, none of the family members so much as suffered frostbite while awaiting rescue. You can learn more about the hero dad’s resourcefulness HERE. Before adding any preps to your vehicle, make sure that it is well maintained, because not having a breakdown in the first place is a better plan than surviving the breakdown. Change your oil as recommended, keep your fluids topped up, and keep your tires in good condition, replacing them when needed. As well, particularly when poor weather is imminent, be sure to keep your fuel level above the halfway point. If you happen to get stranded, being able to run your vehicle for increments of time will help keep you warm. Build a relationship with a mechanic you can trust, and pre-empt issues before they become vehicle failures at the worst possible time. What’s in my vehicle emergency kit? Disaster can strike when you least expect it, so now is the time to put together a kit that can see you through a variety of situations. I drive an SUV, and I keep the following gear in the back at all times. You can modify this list for your amount of space, your environment, the seasons, and your particular skill set. Some people who are adept at living off the land may scale this down, while other people may feel it isn’t enough. I make small modifications between my cold weather kit and my warm weather kit, but the basics remain the same. While you should have the supplies available to set off on foot, in many cases, the safer course of action is to stay with your vehicle and wait for assistance. Some people feel that having a cell phone means they can just call for assistance. While this is a great plan, and you should have a communications device, it should never be your only plan. What if there is no signal in your area or if cell service has been interrupted? What if you simply forgot to charge your phone? In any scenario, calling for help should never be your only plan. You should always be prepared to save yourself. and a smaller 10 gallon tote, with individual components in small containers within them. The police flashlight is also a taser. It’s sort of hard to see but in the photo above, the container is a stocking hat for warmth and a waterproof hat that will also provide some sun protection. Inside the container are two pairs of socks, a rain poncho, a Berkey sport bottle (it can purify up to 100 gallons of water), and a space blanket. Each of these is topped off with a hoodie in warmer weather. In the winter, gloves and scarves replace the hoodie. is not the Taj Mahal of tents. But it fits easily into a backpack and would be sufficient for day-to-day emergencies in warmer weather. In the winter, and anytime we are going further from home, we have a bigger sturdier tent that we put in the vehicle. This would be used in the event that we were stranded but for some reason, unable to use the vehicle for shelter. Generally speaking, your vehicle will provide better shelter and safety than a tent. All of the above mini-kits go into one big 18-gallon tote. Also included are a few different types of rope, a compass, a road atlas (I like the kind that are spiral-bound), WD-40, duct tape, and a 4 pack of toilet paper. There is room for 2 warm blankets folded on top. I use a separate smaller container for food and hygiene items. 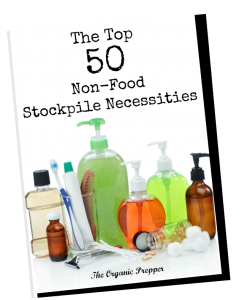 Our food kit contains graham crackers with peanut butter, pop-top cans of soup, pop-top cans of fruit, antiseptic wipes, hand sanitizer, baby wipes, garbage bags, spoons, forks, a survival guide, and plastic dishes. Not shown: ziplock bags of dog food in single servings. These collapsible pet dishes are lightweight additions for a backpack. In a pinch, they could be used for human food also. The second large tote in the back is a lot fuller in the winter. I leave it back there year-round because it keeps the other container from sliding around and it makes a good container for shopping bags and small items that I am transporting. In the winter, I have a pair of heavy, snow and moisture resistant winter boots for each passenger, snow pants, and winter coats. Since the coats and snow pants are squishy, we can still put grocery bags and parcels on top of them. Not shown: My vehicle has space beneath the back seats, where we store tightly rolled sleeping bags. If I didn’t have this space, I’d be able to put them in the tote that holds the shoes. Because of extreme temperature fluctuations throughout the year, the food should be rotated out of the vehicle every couple of months so that you always have fresh food available. In cold weather, your water bottles should have about 2 inches of the water removed to allow room for expansion when the contents freeze. Always have a backpack for each family member. If you are forced by circumstances to leave your vehicle on foot, you want to be able to carry as much of your gear as possible. Depending on the laws in your state (and your interest in complying with them) weapons and ammunition can be very useful additions to your vehicle kit. Your kit should change with the seasons. Snow pants won’t do you much good in the heat of summer, but extra water will be invaluable. When taking a longer trip, add more food and water to your kit than you might normally keep in it. Don’t forget about communications: you can summon help with a cell phone or a two-way radio. Not every person needs every item on this list. 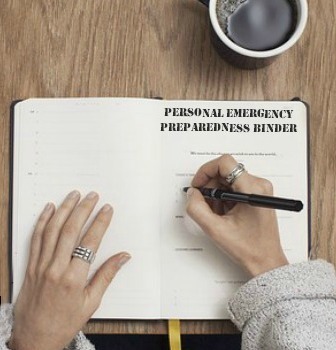 Pick and choose the items that are important given your family situation, your environment, and your most-likely disaster scenarios. No list can be comprehensive for every person, but this one has served us well. – don’t go cheapo on this. The better quality could save your life. Do you have any other supplies to add to the list? Have you ever needed to use your vehicle emergency kit?